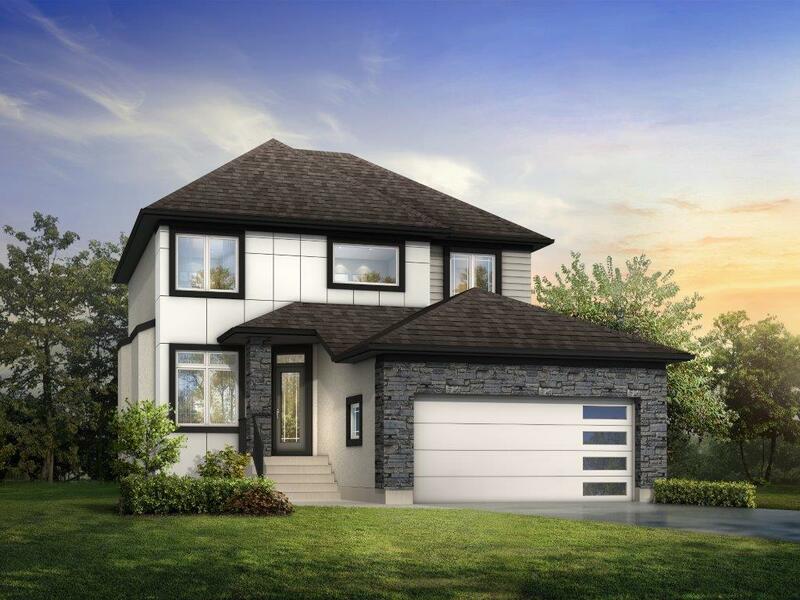 The San Danielle is a 2-storey, 1,922 sq. ft. luxury home. This large 3-bedroom + loft, 21/2 bath design is perfect for a large family. The house is suited for entertaining, with its open-concept layout, formal dining room and its large great room featuring a custom maple entertainment centre and double-sided tiled fireplace. The kitchen boasts a combination of enriched white cabinetry complimented with black bean lowers, quartz countertops, enlarged island, eating bar, tile backsplash, a desk work station and a walk-in pantry. The main floor shines with laminate floors throughout, glass insert staircase with maple railings, and soaring 18′ ceiling heights in the front foyer. The master suite has an enlarged walk-in closet, a deluxe ensuite with double vanity sinks, a 6′ drop-in ceramic tile jetted tub and a stand-alone custom, frameless, glass-tiled shower. It has an exterior contemporary design with wood paneling stone finish detail, an abundance of oversized windows and a large deck in the back yard. Log in or sign up to instantly see The San Danielle.